Here is a sample, of the reverse engineering going on, regarding Combo/Chains and resulting Attack Lines, for character "Justice". 3 +4(1/2+2=7) +3	= [3,3]	? NOTE: Apparently even using a code block, does not keep font TABs as they should, so it's a lot harder to read. "1"..."9"	amount of balls matching for a chain pop. "(N/M=X)"	is when M "ICE" balloons transform (due to being touched by a forming chain), where N transformed balls are included in the chain, adding to a total of X balls matching for that chain pop. "p"	means when the action/result of the "power up" is actually popped. "_"	represents a collapse, due to previous balls disappearing. "= [a,b,c]"	is the resulting sequence of lines thrown at the adversary. So you may ask, what is this all about ? I basically went through a bunch of videos, grabbing all the combo sequences, to be able to analyse them, in order to reach some approach to what the Arcade game is exactly doing and how. After observing, a lot of videos, I came up with the above language to represent the Combo/Chains and resulting number of Attack Lines, trying to get only the facts and not do any assumptions, before I understand the problem. After analysing a lot of this, I think I now have a "reasonable" idea of what seems like a solution, based on sample tables like the above. However, there still are strange cases that I can not explain completely. Either I grabbed them wrong ( I did a mistake), or something is off. (I'll probably have to recap these videos and next time note video and start time of combo, so that later I can confirm I grabbed the combo essence correctly if any doubt surfaces). For example, I know I have done 7 line combos, in the past, but never saw one in the videos I processed, and some samples, seem to suggest a maximum of 6 lines, while I read in a fAQ that it can get to MAX of 8 on Magical Drop II. NOTE, I have not video tapped my own play yet. Given that this is a lot of grunge analysis work, I'll probably prioritize doing more code, with my current knowledge/assumptions, instead of pursuing for 100% accurate for now. I have been working on the PULL/PUSH and Popping (ICE does not pop by itself) actions and animations. Pushing 2 Yellow balls going up. This will POP the yellow Balls, as well as the ICE (White) Balls, since they transform into the same color, when touched by a forming Match of 3 or more balls. So all the ICE balls that transformed into Yellow, are now included in the current Match 3 or more, makeing for a huge POP. I can say, it has been harder then expected, due to some nuances of the behaviour. Full state machine is not complete yet. Board Holes, left after popping some balls. Still have to implement the roll up, when popping creates "holes" in a column ( vertically). Since those balls are not supposed to be left hanging in mid air. Still researching some stuff, once I find something else that I missed, when the issue presents itself in the code, usually some unforseen condition. This does take a while to debug, when something weird surfaces. There are also some edge cases, that must be accounted for, like for example, when a Clown has a lot of balls to pop at once, but the user chooses a column where they will not fit. Currently I abort, as if the player lost, since Clown still has some balls after pushing them as far as possible into the board. This also affects counting of Popped balls. 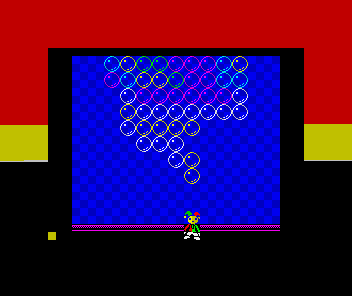 That colored square on the bottom-left, is DEBUG info, so that I can know what is the current color the Clown is holding. There are some playability issues, like properly handling a queue of key presses, instead of the usual check if key is pressed or not. This is required, since the Clown CAN NOT move during a pull or while still pushing balls, to the board. But players usually are quick enough to press move keys, before the pull or push is complete, hence movement is ignored, currently, but then the key press got lost, which feels awkward for the player, like if the machine is unresponsive. Still missing Power ups, and some more stuff for the game engine. Lots of things still to do. Will it be 48 or 128K? A data structure, one byte shorter than it should be. Some unrelated code was overwriting it. Another BUG "bytes" the dust. 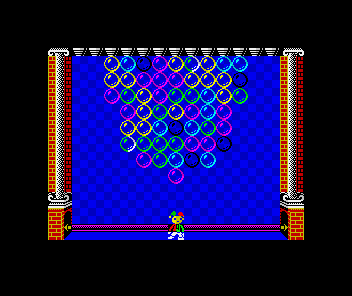 It can be clearly seen that one of the balls was pushed too much further down, making the user lose. 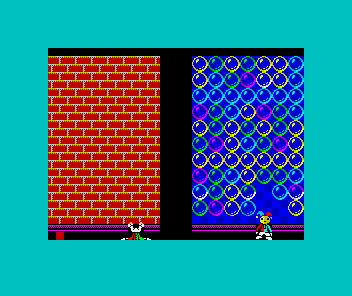 Here player 2 (on the right), also left a ball on the right corner, that eventually got pushed down, making him lose the game. I'm finishing today my last stretch of vacation days to try to finish this on time. Those 3 months of "handy cap", where I was unable to develop the game, were not in my plans at all. Seems doable, but stressful, to have a playable version, but not with everything I planed already in. Wow! rmartins, I've read your game thread and it's incredible what are you doing. 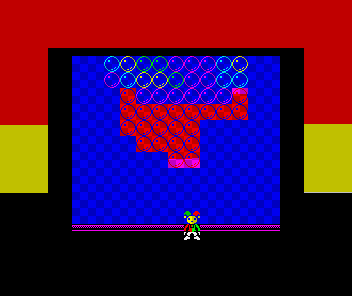 Also, knowing all the problems "out the game" you had (I'm glad all was going better) and seeing all the complexity that involves making such a game like yours, I thank you even more all your help to finish Vindius. Is January 20th finally the last day to submit the games? Also, even if you could not improve that in your initial release, are you planning to put a score board to your game in future? I usually compete in a Retro Videogames Contest (The FaseBonus Arcade Saloon) and we always talk about the lack of score board in new retro-hombrew developments. We think scores were (and are) the "essence" of the classics arcades. Great job rmartins! I hope you could finish it in time! ..., I thank you even more all your help to finish Vindius. Your are welcome. I Hope it helped you finish it. It has been anounced in these forums, that it was posponed, If I'm not mistaken to the end of January. I also like Score Boards, but if it doesn't stick for the next time you launch the game, it looses a bit of the appeal. That is one thing I have been looking as a possible usage for keeping one ROM/Flash page (4KBytes) free on my cartridge system (NOXROM), to be able to keep scores. But having a way to reset it, can also be useful, when the scores get too high, for any one to reach, for a long time. Some Arcade had Non Volatile memories to keep the scores/settings. The most recent Arcade Boards (just before 2000) used Flash too. My plan for Extruder is to keep working on it every night until next weekend, and see what I can come up with. But after the weekend, I have other stuff to work on during the next week. 10 During Christmas, and 5 more last week, but that's it. So whatever I have late last Sunday, will most probably be my last version for the contest. And some internal 'house' cleaning and bug fixing. 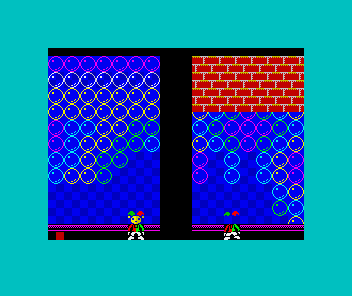 Distinct player colors for 2 player mode, like the Arcade. In order for ball colors to be clearly distinguishable, I had to update the balls to a version with thicker silhuete. This was a known situation, I just did not had the time to swap them until now. Implemented, a nice Sprite/animation for Power Ups. Still pumping code to fiinish. However, I 'm pretty sure that help screens will not be in, due to lack of time. And probably some more graphical stuff. Also did upgrade some sprites. Single Player background, almost done. Some internal upgrades and reviews, on win/Lose end condition. Still need to update a lot of stuff. Looking good! Border bars nicely under control! >> Still need to update a lot of stuff. - Implemented Control selection menu. Supports 6 control possibilities (Kempston, Fuller, Cursor/Protek, Sinclair1, Sinclair2, Keyboard (QAOP), for both players. 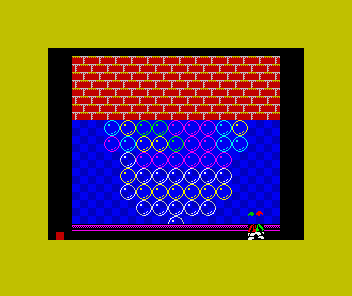 - Added support for different sprite backgrounds between 1 Player and 2 Player modes. 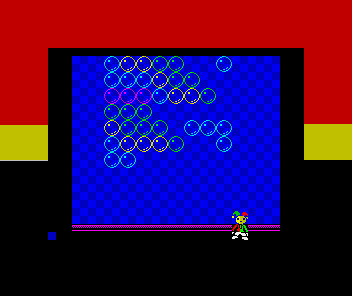 - Changed Player1 difficulty (percentage of ICE balls and Power Ups, and Drop Speed). 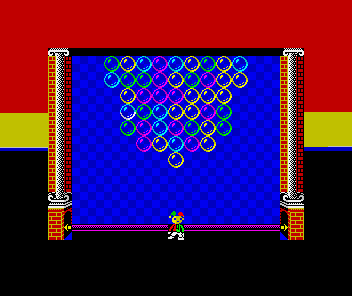 NOTE: in single player, there is a need to support a bubble in the future (which seems more logical to be White). - Some extra animations added. Still have a lot of free mem, but I'll probably will not be able to add some of the graphics, since it requires some UI changes to fit them in, and I also have not finished all character graphics. Will keep on pressing probably until tuesday. Tonight, will probably be my last stab at finishing whatever is possible until the deadline. Hopefully, tonight I'll be able to stay awake, to finish some of the stuff still pending. Go go go go Rui!